I am amazed at the variety of Indian breads one can make... Naan, Mooli Paratha, Roomali Roti, Lachha Paratha, Bhakri, Ragi Rotti, Tandoori Roti. For most weekday lunches, I generally make Phulka. I know, it becomes monotonous sometimes. Today's special is North Indian whole wheat Lacha Paratha. These take a couple more minutes than regular roti, but can be made on a busy day. You don't need any fancy ingredients, just atta and ghee. The same layered flat-bread when made with all purpose flour (maida) is known as Kerala Paratha. In a mixing bowl, add wheat flour and little salt. Mix well. Now, add water little at a time and knead to form a smooth, soft dough. You can add 2 tbsp oil or ghee as well. I don't add any oil or ghee while kneading to cut down some calories. Cover the bowl with plastic food wrap and let the dough rest for 30 - 40 minutes. Divide the dough into 4 or 5 round balls. Dust your work surface or board with some flour. Apply some flour to the rolling pin as well. Flatten each dough ball and roll each dough ball as thin as chapati. Apply 1 1/2 tsp oil or ghee and spread it all over the rolled chapati. 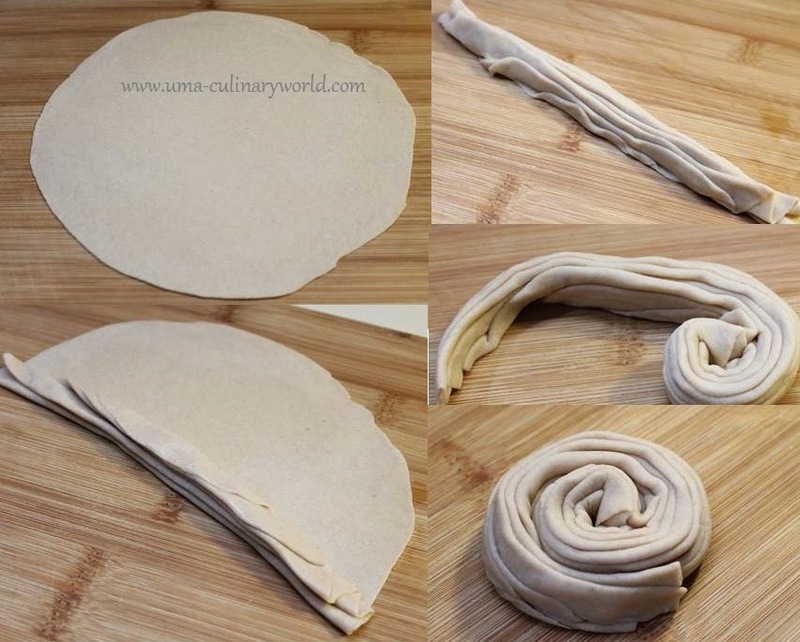 Fold the rolled chapati like a fan. These folds will be the layers/lachha for the paratha. Gently pull and elongate the dough and press it like a Swiss roll. Slightly dust the roll again and gently roll it, slightly thick. Too thin parathas won't show the layers well. Heat a tawa/griddle and roast both sides of the rolled paratha until golden brown. Apply some more ghee while roasting. Repeat the same for other dough balls. Serve soft, crisp Lacha Paratha with a curry of your choice.